Have you ever gotten, and/or worn, an ugly Christmas sweater? 1. Yes, grandma made me do it. 2. Yes, I love my ugly sweaters! 3. What's an ugly sweater? What's your idea of an ugly Christmas sweater? All of my sweaters are solid black. Is that ugly enough? BUT I NEED MORE. Like maybe this one! I saw a delightful sweater at Walmart that said, "Meowy Christmas" and had a photo of a kitten on it. That's my kind of tacky/ugly Christmas sweater. 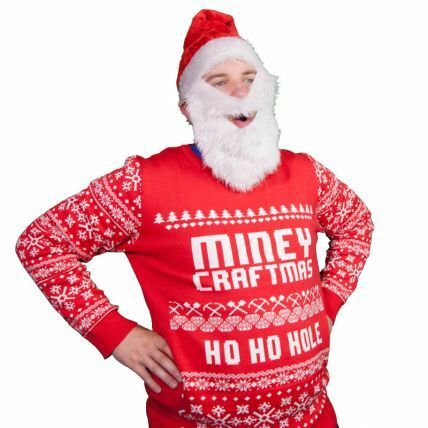 I kinda love the ugly Christmas sweater craze, but I've never pulled the trigger on buying one. Facebook keeps giving me ads for this Zelda one that I would absolutely love but absolutely cannot justify the purchase of. If you would absolutely love it then that sounds like justification for the purchase. In related news I have my Sonic Christmas sweater which is the only one I will ever need. It is beautiful and I wear it year round. You can wear it every year.